US forces have carried out a raid on an al-Qaeda compound in Yemen, killing seven militants, the US military says. They were killed "through a combination of small arms fire and precision air strikes" in the Marib governorate, east of Sanaa, on Tuesday morning. The primary objective of the operation was to gather intelligence. The military did not say whether there were any US casualties during the raid which was supported by the Yemeni government. In a statement, the US Central Command says the militants were members of Al-Qaeda in the Arabian Peninsula (AQAP). "Raids such as this provide insight into AQAP's disposition, capabilities and intentions, which will allow us to continue to pursue, disrupt, and degrade AQAP." The US has carried out frequent strikes on al-Qaeda's bases in Yemen, often using unmanned drones. 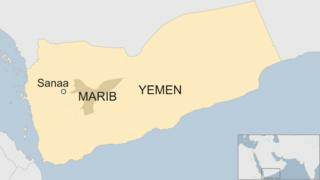 In January, it said that 14 militants were killed during a commando raid on an al-Qaeda stronghold in central Yemen. Al-Qaeda has taken advantage of the chaos caused by the conflict in Yemen to entrench its presence in the south and south-east of the country. For the past two years, the country has been embroiled in fighting between forces loyal to the internationally recognised president, backed by a Saudi-led coalition, and Shia Houthi rebels.